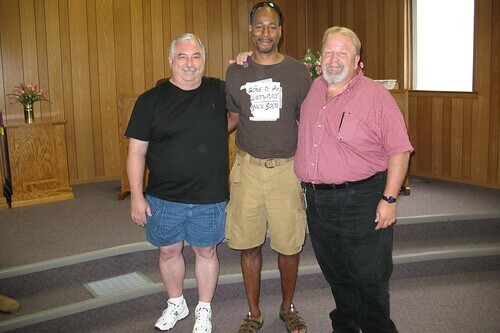 I had a rare opportunity to meet some fellow on-line seekers face-to-face this weekend. I went over to the booming metropolis of Straughn, IN to meet my blogging buddies of a couple of years, Bruce and Geo. Unfortunately, Steve couldn't make the gathering. I also had the opportunity to meet and listen to and meet Mike Williams in person. The Grace Gathering 2007 was a special time and I want to thank Cliff, Bruce, Geo and Steve for their sacrifice (in more ways than one) in putting it together. Cliff, Steve, Bruce and George have combined their blogging efforts into Bold Grace now. The day I attended (Saturday), Mike was speaking on the difference between Redemption and Salvation. If you think they're one in the same, you owe it to yourself to listen to this talk. BTW, a bit of a spoiler... Redemption is something we all have and that G-d has accomplished (past tense) on His own with no help from man. Salvation is something we all need (and it's not a one time thing). Mike spoke from Romans Chapter 10 (and Chapter 5) and did a wonderful job of breaking it down over the period of about an hour and a half. Friday, Mike spoke about his discovery that G-d is not angry with us. The talks from the weekend are available at Bold Grace- here. These guys took me under their collective wing a couple of years back when I first started exploring universalism (a word they hate and I'll explain that later). I can't remember how I found them or they found me. But, they turned me on to Mike Williams who is a gifted preacher and Bible scholar who happens to believe that Jesus' work on the cross is finished and He accomplished the task of saving everyone. One thing that is interesting about these guys though is they shun any attempt at labeling them. So, when I mentioned universalism, they kind of bristled a little. Their impression is that Universalists believe in a temporary "hell" or period of punishment. That is somewhat true. Many Universalists do believe in a period of correction (burning away of the dross if you will). But, not all. See my post here for what my thoughts on what a Universalist is. IMO, these guys are Universalists. click on the picture to have the opportunity to see the full set on Flickr. Anyway, I digress, back to the meeting. I walked in as they were having a sharing time. What was funny is I saw Mike Williams sitting in the front row as I walked in and the guy speaking was addressing him. But, I had this picture in my mind of Mike as an older guy, a little guy (for some reason his voice on the recordings I had heard sounded like a little guy) and kind of conservative looking. But, Mike is a big, shaved bald guy who was wearing cowboy boots. He's well-built and an imposing figure. Kind of like an NFL tight end. Mike's speaking voice though is not intimidating at all and his knowledge of the Bible is amazing. What also comes across in his speaking is his absolute love and reverence for scripture and his total commitment to Jesus. That is one thing that could not be any clearer when you listen to Mike. As he was speaking I was reminded of a commenter here a couple of days ago who implied those who believe Jesus will save all are ignoring scripture. No one could make that accusation of Mike. Mike also made it very clear both days that he spoke that he believes in Jesus and the Gospel story literally (from the virgin birth through the resurrection and ascension). Both days he spoke, he took time out from un-teaching the distortion of the gospel most of us have heard all our lives to make a declaration of his faith. It was a very detailed declaration and necessary because if you tell people you don't have to believe Jesus saved you to be saved by Jesus, they automatically think you must be some kind of lunatic or worse, a liberal. Mike's websites are Gospel Revolution and Gospel Logic. Many of his talks are archived there. "The day your heart is kinder than your doctrine, rest assured it's not your heart that is wrong." I agree with Mike 100% on what he said there. I don't take scripture as literally as Mike. I don't even attempt to reconcile everything in the Hebrew Scriptures with what we know about G-d today (or think we know anyway). I believe in progressive revelation. Paul said we see through a glass darkly. I believe that has always been the case and that the glass is getting a little more clear (even though it's still darkly). I believe the UCC motto that "God is still speaking..." and I think we're slowly, slowly hearing. But, what is really cool is that while we may not agree on the mechanics of how we got here, we do agree that God is bigger than Churchianity teaches and that he will (or has) redeem every last one. George, Cliff, Steve and Bruce have a thing of telling each other how perfect they are. I guess they are talking about being perfectly righteous because of God's grace. But, I have to admit it makes me a little uncomfortable. I'm more in line with Martin Zender's view that we are Flawed By Design. I'm perfect for what I was designed to be. But, I still have quite a ways to go to be the person I am capable of being. However, I think their reminder of their perfection is a far cry better than the condemnation of the traditional teaching that says we are all still just miserable sinners. Anyway, the Grace Gathering was a very special time. I am hopeful that as George and Bruce are saying this is just the beginning of a revolution. I'm certainly ready to do my part to make sure that happens. Where do I sign up? Hi Brian. I agree with you that the Law, Psalms, and Prophets aren't as perfect as Mike believes they are, but I'm happy that we've all rejected the traditional evangelical view of God. 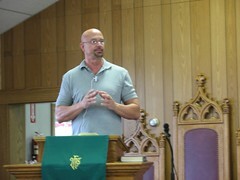 Mike has been a tremendous help and relief to my soul since I first heard his teaching last year. I've never actually met George or any of those guys, but I do know that George has lost a lot of weight since you met him 5 years ago. Here's a video of him from last year!